It was a remarkable day in director Nikhil Advani’s life as he received the National Award for his stereoscopic 3D animation film Delhi Safari. Released on the 19th of October 2012, the film won the award of the Best Animation Film. 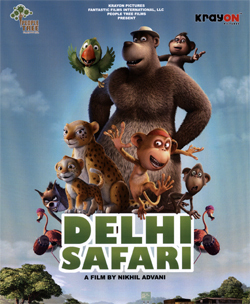 Delhi Safari takes its viewers to an interesting journey with cross-cultural characters. The film highlights the real world themes about urban sprawl and the effects of humanity on the global ecosystem. The animation in the film certainly defined the new age technology. Director Nikhil Advani and the team of animators at Krayon Pictures have put time, energy, passion and 3D technology into ensuring that their family entertainer is of a standard thus far not seen in the nation. It is also one of the few animation films that did well in the overseas market. Apart from the new-age animation, Nikhil has also made sure that the story of the film is heartfelt. With an interesting story-line and new-age animation, Nikhil Advani’s Delhi Safari is an entertaining crossover piece and well deserving to win the National Award!